Argentina chaired the G20 presidency under the theme Building Consensus for Fair and Sustainable Development. Emphasizing fair and sustainable growth as a pillar of development, three priorities were central under Argentina’s presidency: the future of work, infrastructure for development, and a sustainable food future. On the back of an ambitious domestic agenda, Argentina’s calendar has certainly been a loaded one, hosting 84 working group meetings, 48 Sherpa meetings, 28 finance meetings, and 7 engagement group meetings culminating with the Leaders’ Summit. 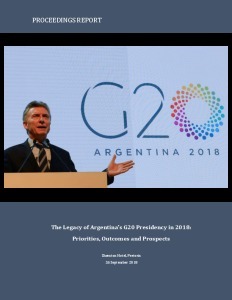 Argentina’s President Mauricio Macri was also keen to utilise the G20 platform to advance the interests of the Latin American and Caribbean region and the Global South more broadly. 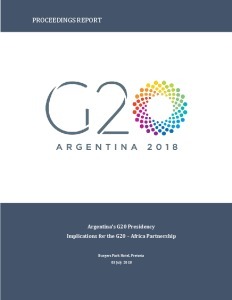 Argentina’s hosting of the G20 summit in 2018 presents a significant opportunity for it to represent the needs and expectations of Latin America and the Caribbean (LAC) as a whole, as well as advancing a cohesive regional strategy of the Latin American bloc within the G20 (Argentina, Brazil, and Mexico). Historically, Latin American regional priorities have often been marginalised in G20 debates as a result of the failure of the Latin American bloc to present a well-articulated, cohesive position on key issues on the G20 agenda. The round table, which focused on South Africa’s 2018 foreign policy agenda during the course of the year, also looked towards possible projections for 2019, and took place on the 22 February 2018 in Pretoria at the Human Sciences Research Council (HSRC). South Africa’s 2018 foreign policy agenda is possibly its busiest since 1994. 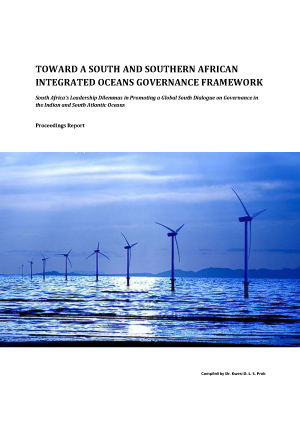 The country finds itself chairing the Brazil, Russia, India, China and South Africa (BRICS) partnership and the Indian Ocean Rim Association (IORA), while it is also involved in the G20 summit. It also co-chairs the Forum on China-Africa Cooperation (FOCAC), as well as chairing the Southern African Development Community (SADC). This provides an opportunity for the country to continue its pursuit of a developmental African and global South agenda. Dr. Philani Mthembu, Executive Director of the Institute for Global Dialogue (IGD), opened the dialogue by providing a brief review of South Africa’s diplomatic calendar for 2018, which is one of the busiest in the post-1994 era. The BRICS partnership, one of several foreign policy agenda items, has continued to evolve as it enters the beginning of its second decade. 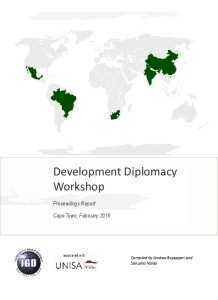 BRICS is no longer just a high-level government-to-government partnership; it has grown to include numerous tracks of diplomacy and increasingly put an emphasis on the importance of people-to-people relations through track two (think tanks and business) and track three (civil society) diplomacy. Dr. Philani Mthembu, Executive Director at the Institute for Global Dialogue, opened the event by contextualising the day’s discussion and explained that the dialogue falls under South Africa’s second track diplomacy, whereby academic institutions, think tanks and researchers interact. 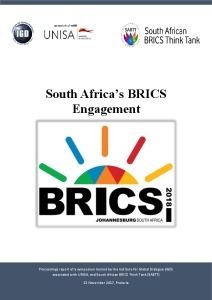 South Africa pushed to have this interaction institutionalised in 2013 through its first BRICS Presidency. He then outlined that this policy dialogue will expand a number of topics that have been discussed at numerous BRICS meetings throughout the year involving the South Africa BRICS Think Tank, other research or think tank organisations, universities, civil society organisations, and government departments, such as the Department of International Relations and Cooperation (DIRCO). 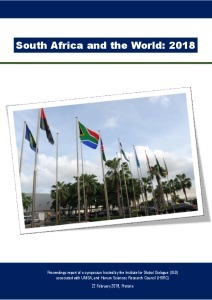 This symposium, focusing on BRICS in Africa, took place on 3 July 2017, in Johannesburg at the South African BRICS Think Tank (SABTT), which is hosted by the National Institute for the Humanities and Social Sciences (NIHSS). The symposium was an informative and strategic multi-stakeholder discussion that sought to address the topic of situating the future of BRICS in changing global dynamics with a closer focus on BRICS in Africa in relation to trade and development finance, BRICS soft power dynamics and where South Africa fits into this outlook and how it is able to leverage its position. 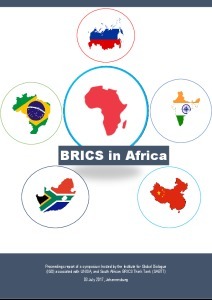 As BRICS countries, such as China, through the Forum on China-Africa Cooperation (FOCAC), and India, through the India-Africa Summits (IAS) intensify their engagement on the African continent, the symposium looked into the role of the BRICS countries in Africa, especially given the potential of the BRICS New Development Bank (NDB) and its Africa Regional Centre (ARC) in Johannesburg. 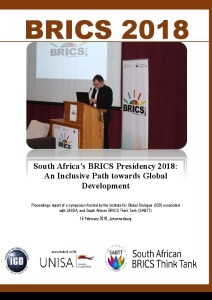 This event thus explored how South Africa uses its position within the BRICS to promote its African agenda and the BRICS engagement in Africa. 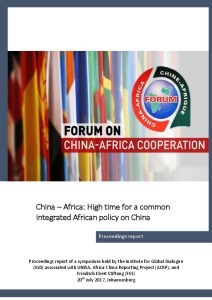 The Institute for Global Dialogue, in partnership with the Friedrich Ebert Stiftung (FES) and the Wits Africa- China Reporting Project (ACRP) held a one-day symposium at the University of the Witwatersrand on 20th July 2017, on the theme China – Africa: high time for a common integrated African policy on China. With preparations for the 9th BRICS Summit under the Chinese Presidency in progress, question marks on the future of the BRICS are repeatedly raised. 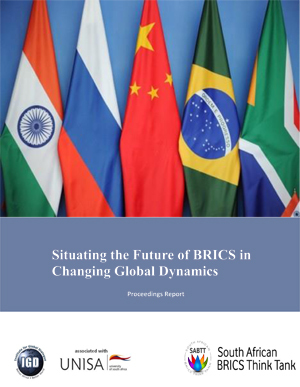 The following symposium, organised into a panel discussion, breakaway sessions, and plenary, sought to explore some of the future scenarios of the BRICS in changing global dynamics. It looked into existing power dynamics in the grouping, with Russia, China, and India vying for influence, while South Africa and Brazil seemingly lagging behind as they confront various domestic challenges. Bringing together over 50 stakeholders from government, academia, think tanks, civil society, business, labour, embassies, and other non-government organisations, this symposium also considered the potential impact of closer relations between the US and Russia under the Trump Presidency, while addressing the question of a consolidated BRICS agenda and enhanced BRICS strategic cooperation and coordination of regional agendas.